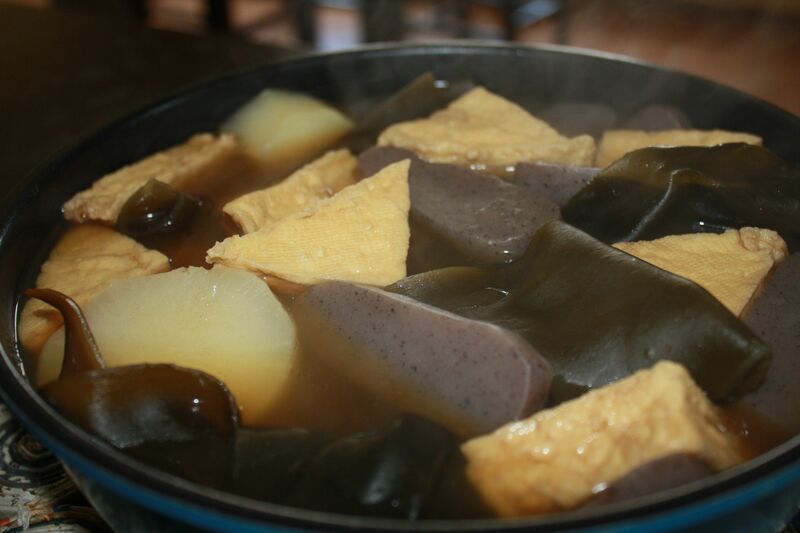 Oden/Odeng soup is one of my favorite winter foods! Not only is it delicious, I always feel cleansed and centered whenever I have it. Oden soup is a one-pot soup that includes shiitake mushrooms, radish, potatoes and Konnyaku (yam cake), with a really amazing broth. It’s obviously so— good for you, especially in the winter, with tons of sea and root vegetables. If you are in Seoul during the winter, you will not believe how many oden street carts there are on the streets. While Bill and I don’t really get oden in Seoul as they usually have fishcake in them, it’s still fun to watch how busy the oden carts on the streets are. People cram into those small oden carts with friends and colleagues to have oden soup – often with ddeokbokki (spicy rice cake). So I make my vegan oden soup when I feel like walking the winter streets of Seoul. I hope you try out this vegan oden soup this winter. I promise you will find it truly calming and nourishing! 1. Soak kombu and mushrooms in 5 cups water for about 1-2 hours. 2. Pour soaked kombu and mushrooms (cut in half) with water into pot. 3. Peel and cut the daikon radish (2 inch thick slices) and put in pot. 4. Cover the pot with a lid. Bring water to boil and lower heat and simmer for 30 minutes. 5. While simmering, cut the konnyaku (1 inch thick slices). 6. Using another pot of water, put in the konnyaku and bring it to boil, and drain. 7. Put konnyaku slices into the pot together with the other ingredients and let it simmer for for 20 minutes. 8. Peel the potatoes, cut them into 2 inch thick slices, and put them in the pot. Bring to boil and then lower heat. 9. Wash and soak the deep-fried tofu in hot water for 5 minutes to remove oil, and cut into triangular shapes (or they might already be cut when purchased) and put into pot. 10. Season with sugar, salt, and soy sauce to taste. 11. Let it come to boil and then lower heat. Simmer for 50 minutes (or longer, the broth gets better if you simmer it longer). Add some water as needed. 12. 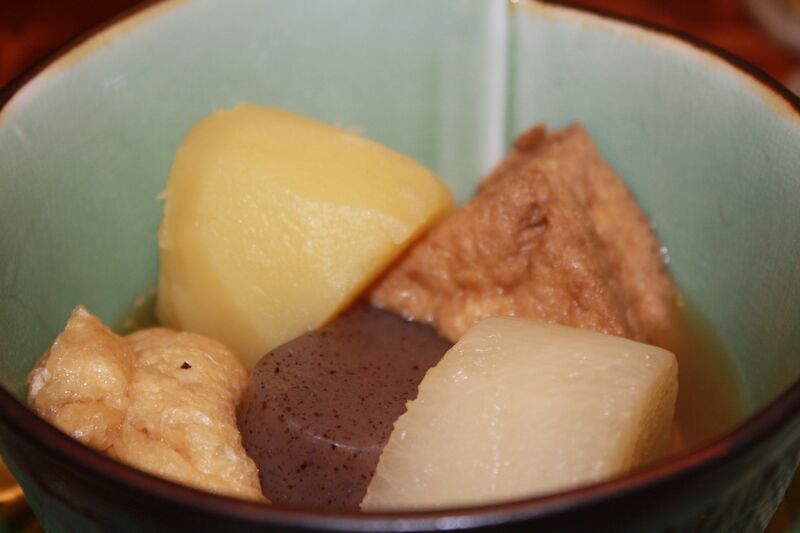 Enjoy the delicious broth and yummy radish, potatoes and tofu. Mmm… it’s such a perfect meal for winter. We put the pot on the table and share, using smaller bowls! For those who are not familiar with Konnayku, this is Konnyaku (yam cakes) that you can find in Asian grocery stores! Hi Sunnie! I bought the konnyaku yesterday so I could make this recipe. I noticed that the one in your photo is brownish color. The one I bought is white. It says konnyaku and yam cake on the package. Are there two different kinds or is it just difference in brands? Thanks for your help! Hi, Julie! Yes, usually the same company will make both white and brown konnyaku. 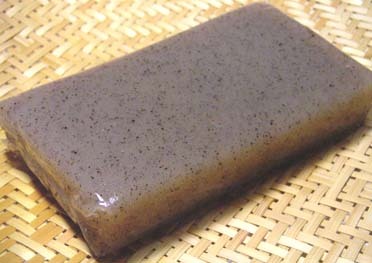 Brown konnyaku is brown due to the kelp powder in it, white is usually pure yam. I tend to buy the brown because it’ll make the broth a bit stronger. But white konnyaku is just fine! The key to this dish is to be patient 😛 and let it simmer for a long time. I hope you like it, Julie, let us know if it turned out okay! By the way, we loved your VeganGurl shop on Etsy, I think I might get one of those heart pins that are so adorable! Hope you have a great holiday season Julie! Thanks for sharing the recipe and for visiting my shop! Oh and I don’t celebrate any holidays, but thanks anyways 🙂 I hope you have a wonderful week!